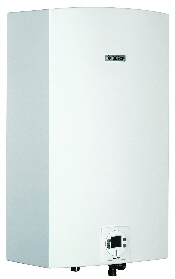 The NEW Bosch AquaStar 2700ES LP (Liquid Propane) Tankless Water Heater is built to supply 2-3 major applications at a time! With a maximum BTU input of 199,000 BTU/hr, this heater is Bosch's most powerful offering. In warmer climates, you may be able to run 3 simultaneous showers! The Bosch 2700ES LP can easily be converted to an outdoor heater for qualifying locations by adding the optional AQOK Outdoor Kit. With an average life expectancy of more than 20 years, energy savings of up to 50%, and an endless supply of hot water, your family will thank you for years to come. Easy to install with multiple venting options, the Bosch AquaStar 2700ES-LP whole house tankless water heater is the right choice.